The antihypercholesterolemic and antiatherogenic effect of hydroalcoholic extracts of Amaranthus caudatus L(A. caudatus). on regression of atherosclerosis in experimental rabbits maintained on a high cholesterol diet. Twenty five rabbits were randomly divided into five groups of five each and treated 75 days as follows: Group I: normal diet(ND), Group II: Hypercholesterolemic diet (HCD) for 45 days; Group III: Hypercholesterolemic diet (HCD) for 75 days, Group IV and V: HCD for 45 days and then normal diet and normal diet + A. caudatus(150 mg·kg day) respectively for an additional 30 days(regression period). Blood samples were collected before (0 time) and after 45 days and 75 days of experimental diets for measurement of biochemical factors. The aortas were removed at the end of the study for assessment of atherosclerotic plaques. In regression period dietary use of A. caudatus in group V significantly decreased total cholesterol, LDL-cholesterol, malondialdehyde, C-reactive protein while apolipoproteinA and HDL- cholesterol was significantly increased compared to group IV. The atherosclerotic area was significantly decreased in group V. Whereas, the animals that in regression period received only normal diet showed no regression but rather progression of atherosclerosis. These results thus suggest that hydroalcoholic extracts of A. caudatus can reduce risk factors and cause regression of fatty lesons in aorta. Atherosclerosis is a dynamic and reversible process . In animals fed a cholesterol-rich diet, lowering of plasma cholesterol levels promotes the regression of atherosclerotic lesions [1–3]. Evidence for atherosclerosis regression in humans has also been reported [4–6]. Although plasma lipid lowering is a major driving force, the mechanisms that promote lesion regression and stabilization are not clear . Recent reports indicate that the reversal or regression of lesions can be achieved by aggressive lipid lowering or drug treatment [8, 9]. Hypercholesterolemia induces oxidative stress, which is known to have adverse effects on the integrity of cells . Antioxidants and hypolipidemic agents suppress the development of hypercholesterolemic atherosclerosis and induce regression of atherosclerosis. Suppresses the development of atherosclerosis is associated with decreases in oxidative stress and serum lipids [11–13]. Amaranthus Caudatus L.( A.Caudatus) which is synonym with Amaranthus Paniculatus L. was used in some studies. Grain and leaves of Amaranthus are utilized as food for human beings as well as for animals  and their nutritional value have been extensively studied . Amaranthus leaves are an excellent source of protein, fiber, squalene, anthocyanins and tocotrienols [16–18]. Squalene is an intermediate in cholesterol biosynthesis and is found in humans under the skin and inside the adipose tissue . The physiological effects of dietary flavonols are of current interest due to their in vitro anti-oxidative and anti-inflammatory activities . It was recently shown positive effect of A. caudatus extract to decrease of cholesterol level, reduced serum lipid levels to atheromatous plaque formation [19, 20]. Qureshi et al. (1991), shows that A. caudatus extracts contains tocotrienol and tocopherol . Recently, it has shown that these two substance regulate cholesterol metabolism . This study assessed the ability of Amaranthus Caudatus L. to reduce atheromatous plaque formation and also its ability to regress atheromatous lesions in hypercholesterolemic rabbits by analysing biochemical markers such as total cholesterol, triglyceride and LDL-cholesterol, apolipoproteinB, malondialdehyde inflammatory markers such as C-reactive protein (CRP) and lesion in the aorta by histochemical analysis. A. caudatus was collected from Isfahan Natural Resource Institute. They were identified by Dr. Lili Ghaemmaghami and a voucher specimen was deposited at the Herbarium of the Department of Biology, Faculty of Science and Isfahan University (voucher no. 13648). Aerial parts (stems, leaves and flowers) were dried for 10 days at room temperature it was extracted with 96% ethanol for 72 hours and then filtered, and concentrated by vacuum distillation. Solvent was evaporated under vacuum and crude extract was obtained as a dark reddish colour and kept in dark glass bottles at 4°C until use . Total flavonoids content was measured at 424 nm,  and anthocyanins at 535 nm  using spectrophotometeric method. Twenty five male New Zealand white rabbits with average body weight of 1.5-2 kg were purchased from Razi Institute, Teheran, Iran. The animals were housed in steel cages individually in a temperature and light controlled room for 2 weeks, and provided with Super Fosskorn Normal Rabbit Chow, purchased from Pasteur Institute of Iran. The rabbits were divided into five groups of five rabbits each and for 75 days as follows. Group І: Fed with 100 g Normal diet daily (normal group). (75 days). Group ΙΙ: Normal diet + cholesterol suspended in olive oil and added to the diet (1% of food content daily)Which is considered to be a high cholesterol diet(HCD) throughout the experiment (45 days). Group III: Normal diet + cholesterol suspended in olive oil and added to the diet (1% of food content daily)which is considered to be a high cholesterol diet(HCD) throughout the experiment (75 days). Group IV: Normal diet for 30 days. Group V: Normal diet + A. caudatus extract(150 mg kg body weight daily) for 30 days. The study design is summarized in Figure 1. Scheme of the experimental regression period showing the days. Isfahan Cardiovascular Research Center Ethics Committee which is a member of office for human research protections, US department of health and human services, approved the present study, and the animals were handled according to guidelines of Isfahan University of Medical Sciences for Laboratory Animal Sciences for the care and use of laboratory animals. Blood samples (from marginal ear vein) after 12 hours of fasting were collected before time 0, 45th & 75th days. The plasma was obtained by centrifuging the blood samples at 2000 rpm for 15 min Total cholesterol(cho), Triglyceride(TG) and LDL-cholesterol (LDL-C) and HDL-cholesterol (HDL-C) were measured using special kits (DiaSys, Germany) which utilized the colorimetric method, in an autoanalyzer (Hitachi autoanalyzer, Hitachi Co., Tokyo). Concentrations of apolipoproteinA (apoA) and apolipoproteinB(apoB) were also measured using special kits (DiaSys, Germany) in an autoanalyzer (Hitachi autoanalyzer, Hitachi Co., Tokyo) according to the turbidimetric method; C-reactive protein (CRP) was also measured by rabbit CRP ELISA (Rapidbio, USA). We measured Ox-LDL by rabbit Ox-LDL ELISA (Rapidbio, USA). Malondialdehyde (MDA) was estimated by the double heating method of Draper and Hadley. The principle of the method is the spectrophotometric measurement of the color generated by the reaction of thiobarbituric acid with MDA. All these factors were measured at the beginning, 30th and 60th day except for Ox-LDL which was checked only at 60th day. Atherosclerosis index was calculated according to the following formula: AI = LDL-C/HDL-C .
On the 75th day all the groups of animals, were sacrificed by rapid intracardiac pentobarbital injection for histopathological analyze. Grade 2: Plaque at least half as thick as media with accumulation of intracellular lipid, macrophages, and smooth muscle cells. Grade 3: Plaque as thick as the media with an abundance of macrophages, smooth muscle cells, and connective tissue. Grade 4: Plaque thicker than the media with a large intracellular intimal lipid core and inflammatory cell infiltration . All histopathological evaluations were done by a pathologist blinded to the experimental design. All values were expressed as mean ± SD Significant differences among the groups were determined by one-way ANOVA using the SPSS 13.0 software package program. Values of p < 0.05 were taken as statistically significant. Each 100 g powder of A. caudatus results in 3.8 ± 0.029 g extract powder. The amount of total flavonoids based on hyperoside and anthocyanins in 100 g of A. caudatus extract is 0.379 ± 0.02 g and 24.1 ± 1.29 mg respectively. At the onset, no significance was found between the mean values among the study groups. 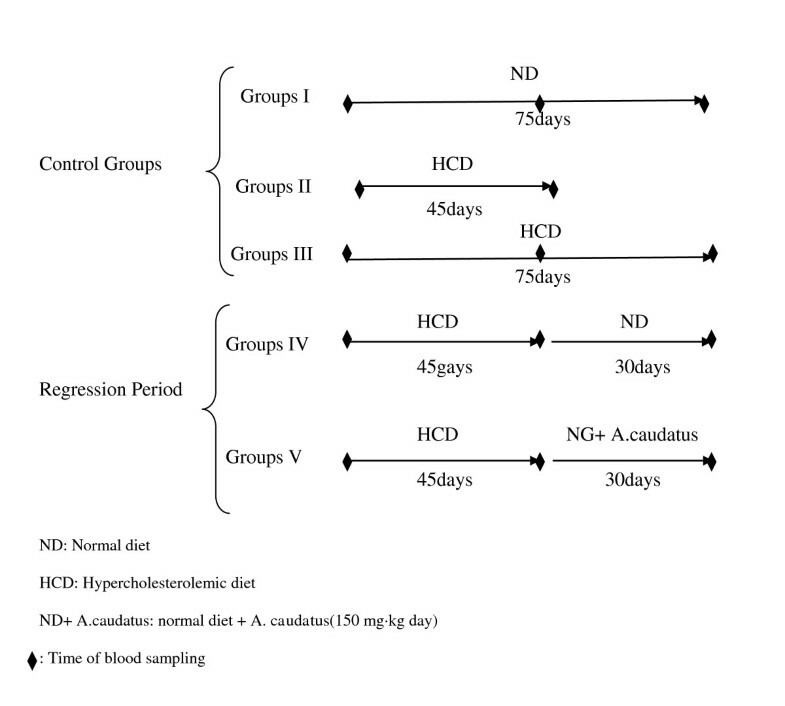 Keeping the rabbits on high cholesterol diet significantly increased Cho, TG, LDL-C, HDL-C, apoB, AI, CRP, MDA, OX-LDL and apoA in Groups II, III, ΙV and V on the 45th days, as compared to Group Ι, However after the 75th days in Groups III as compared to Group I(Table 1). In regression period dietary use of A. caudatus in Group V significantly decreased Cho, LDL-C, CRP, MDA, OX-LDL and AI in compared Group III on the 75th days, whereas in this period in the group fed Normal diet (GroupIV) significantly decreased LDL-C, CRP and MDA in compared Group III on the 75th days(Table 1). During the regression, in the group fed with A. caudatus in addition to Normal diet (Group V) the levels of cho, LDL-C, MDA and CRP were found to be significantly decreased, whereas TG, apoB, AI and OX-LDL nonsignificantly decreased compared to the rabbits fed normal diet (Group IV), on the other hand, this diet the levels of apoA and HDL-C significantly increased in compared Group IV (Table 1). 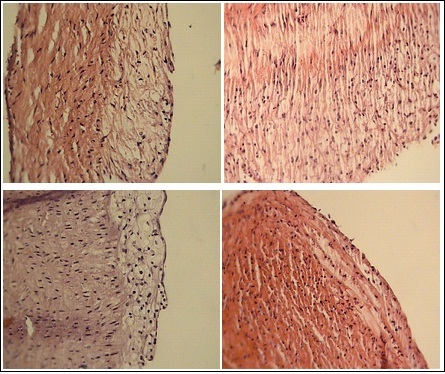 The aorta atherosclerotic lesions of GroupI rabbits showed normal histology. However aortic of atherosclerosis of GroupII (45th days) and GroupIII (75th days) respectiv (1.203 ± 0.34356) and (2.76 ± 0.360555). The ratio of the atherosclerotic lesions area of the GroupIV(1.266 ± 0.416333) and GroupV (086 ± 0.503322) was significantly smaller (p < 0.05) than that the GroupIII(table 2). The was a nonsignificant reduction in the aorta atherosclerotic rabbits fed on normal diet + A. caudatus for 30th days(GroupV) compared with rabbits fed on normal diet for 30th days(GroupIV), indicating that A. caudatus accelerated the regression of atherosclerotic lesions (Figure 2). Histology of aorta and grade of atherosclerotic plaque in studied groups. a: Normal diet + cholesterol (45th days) b: Normal diet + cholesterol (75th days) c: Normal diet + cholesterol for 45th days and Normal diet for 30th days d: Normal diet + cholesterol for 45th days and Normal diet + A. caudatus for 30th days. The results presented above indicate that Amaranthus, has significant antihyperlipidemic and antiatherogenic effects and promoted the regression of atheromatous lesions. This was evidenced by decrease in the extent of accumulation of cholesterol and triglycerides in serum and aorta of rabbits to slow lipid peroxidation process (lower Ox-LDL and MDA), and finally to enhance the inflammatory response of the endothelial cells and accelerated the regression of atheromatous lesions in the aorta as evidenced by significantly low sudanophilic staining. Andrea et al. (2002), shows positive effect of A. caudatus extract to decrease of cholesterol level, LDL-C, VLDL-C and TG . Recent studies has shown A. caudatus extract decreased the most important risk factors of cardiovascular diseases the serum lipoproteins, apoB and Ox-LDL and inflammatory factors prevented atherosclerosis . Amaranthus have Certain particularly soluble fibers, which have a high water holding capacity, appear to be effective in lowering the serum levels of total and LDL cholesterol in both normal and hyperlipidemic subjects . Among the dietary interventions, dietary fibers play a crucial role in lipid lowering . The effect of dietary fiber on cholesterol metabolism has been studied extensively. These effects are associated with increased excretion of bile acids and neutral sterols, increased catabolism of cholesterol, and reduced absorption of cholesterol and fat . Squalene is an intermediate in cholesterol biosynthesis acts as a hyocholesterolemic agent by inhibiting HMG-CoA reductase, a necessary enzyme in cholesterol biosynthesis . Atherosclerosis is widely viewed as an inflammatory disease . Therefore, the reported inverse association between fruits and vegetable consumption(eight vs. two servings/day) and the selected proinflammatory gene expression and significantly reduced CRP levels [32, 33]. The anti-inflammatory mechanisms related to fruit and vegetable consumption are still unclear. Fruits and vegetables also are important sources of dietary fiber , contain several flavonoids and carotenoids with recognized antioxidant properties which appears to have an anti-inflammatory role flavonoids and carotenoids, by an inhibition of NFκB activity, through suppressing the activation-related phosphorylation, and inhibiting the nuclear translocation [34, 35]. Also, dietary fiber intake could participate in weight control and favor weight loss, hypoglycemic actions and hypolipidemic effects . The flavanols and anthocyanins, and their role in the modulation or reduction of risk factors and the prevention of cardiovascular health problems through different aspects of bioeficacy in vascular health platelet agregation, atherosclerosis, blood pressure, antioxidant status, inflammation-related markers, etc.) are consistent. Anthocyanins seem to have a clear effect on endothelial function and myocardium protection , Anthocyanins have an effect on cholesterol distribution, protecting endothelial cells from CD40- induced proinflammatory signalling . In macrophages, blackberry anthocyanins inhibit LPS induced nitric oxide biosynthesis . Anthocyanins have anti inflammatory and free radical scavenging activity . A great number of studies have shown that, anthocyanins prevents endothelial damages and act as an inhibitor of endothelial cell death [39, 40]. Anthocyanins protect endothelial cell by inhibition peroxynitrites that it leads to oxidative damages . The mechanism by which the Amaranthus reduces atheromatous lesion formation and accelerates the rate of lesion regression has not been examined in detail. The hypolipidemic action of the Amaranthus contributes to this. Although the mechanism of the antiinflammatory effect is not clear, the antiinflammatory effect as evidenced by a decrease in inflammatory markers such as CRP may also contribute to the protective effect stress oxidative. The objectives of the present investigation were Amaranthus produces regression of hypercholesterolemic atherosclerosis and regression is associated with reductions in serum lipids and oxidative stress. An investigation was therefore made of the effects of Amaranthus on the regression of atherosclerosis and serum lipids (cholesterol, triglyceride and LDL-cholesterol, HDL-C, ApolipoproteinB(apoB), apolipoproteinA(apoA), malondialdehyde (MDA), hs-C-reactive protein (hs-CRP) as well as atherosclerosis index (AI) and OX-LDL in rabbits. Oxidative stress parameters were assessed by measuring serum malondialdehyde (MDA) an index of levels of oxygen radicals, aortic antioxidant reserve and the oxygen radical-producing activity of white blood cells cells (WBC-CL). Our studies indicate that Amaranth can be considered as an effective natural antioxidant supplement capable of protecting cellular membranes against oxidative. NK Participated in the study design of study, interpretation of results, wrote the manuscript and proof read paper and made changes. SA designed and organized the research, contributed wrote the manuscript and proof read paper and made changes. MS contributed with the conception and design. All authors: read and approved the final manuscript.